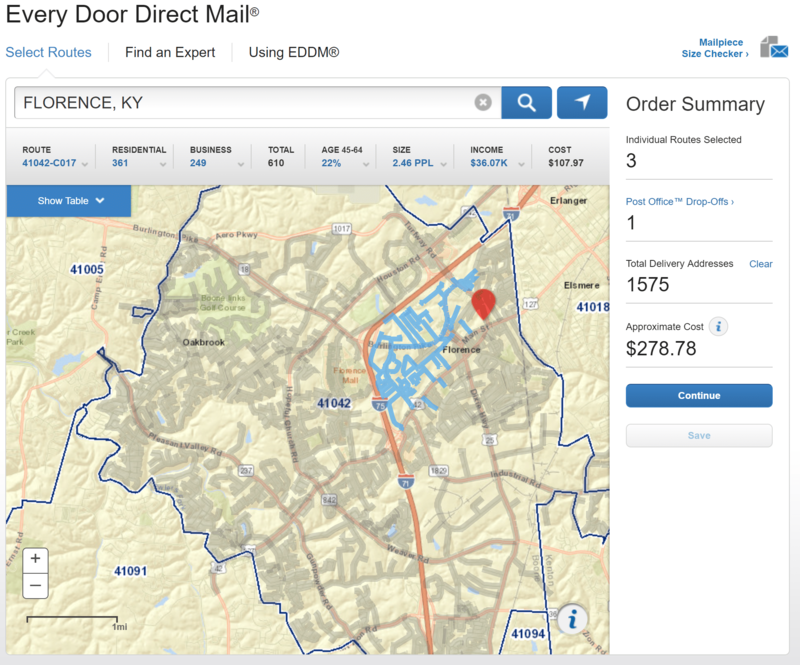 After running a 20,000 mail piece EDDM campaign I wanted to share some insight into the process so in case you want to utilize this marketing method in your business. It is a little intimidating when you get into it, but I think this tutorial will clarify everything and allow you to decide if it is right for your marketing goals. If you like the concept, this guide will walk you through the process. 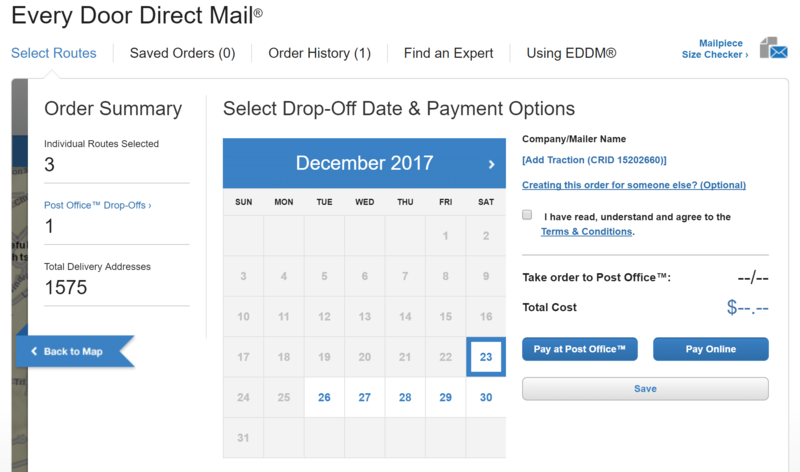 We also have a page dedicated to the EDDM postcard requirements set by the USPS and design tips to ensure you get the best response possible from your campaign. Check out our EDDM postcard requirements and design tips page if you are interested in learning more about the postcards themselves and how to maximize your results. Please know sending one mail piece to each address will yield little to no results. In my 20,000 piece campaign, I designed 2 postcards and had them delivered to the same 10,000 addresses twice, within 5 days of each other. The 2nd mailing is what got our phone ringing! First things first, if you are not familiar EDDM, or Every Door Direct Mail, is a service offered by the United States Postal Service. Using this platform, your mail pieces do not need to be individually addressed. You pick the mail truck routes you want your mail pieces delivered to and then the post office delivers your postcard to every stop on that mail trucks route. The best part is they only charge you $0.177 cents to deliver each piece assuming you are a retail customer. It is definitely the cheapest way to your advertising piece in your potential customer’s mail box! You will want to have your postcards already designed, printed, and in-hand before you pick your routes and schedule your delivery date(s). We will cover this in the walkthrough, but I wanted you to be aware of this before we begin! Step 1: Set up an account* with the United States Postal Service and log in. To do this, click on this link to get to the USPS.com Homepage. In the top right corner, click ‘Register / Sign In’ and enter the requested information. *EDDM has 2 account options. The first is Retail EDDM and the other is BMEU. This tutorial is using the Retail EDDM option. BMEU stands for Business Mail Entry Unit. If you will be mailing more than 5,000 mail pieces per day per ZIP Code, then you would need to set up a Business Account with USPS and pay for your mailing with a permit. 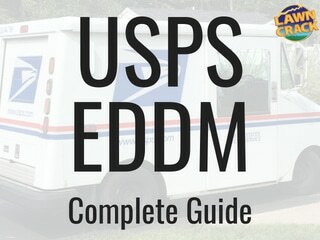 The buttons below contain the Official USPS documents with detailed information on Retail EDDM, BMEU, and a Quick Reference Guide. Step 2: Pick out the routes you want your mail pieces delivered to. To do this, click this link to use the USPS Mapping Tool. MAKE SURE YOU ARE SIGNED IN! If you are not, all information will be lost when you hit continue! Type the city, street, or ZIP Code you want to target in the search bar. 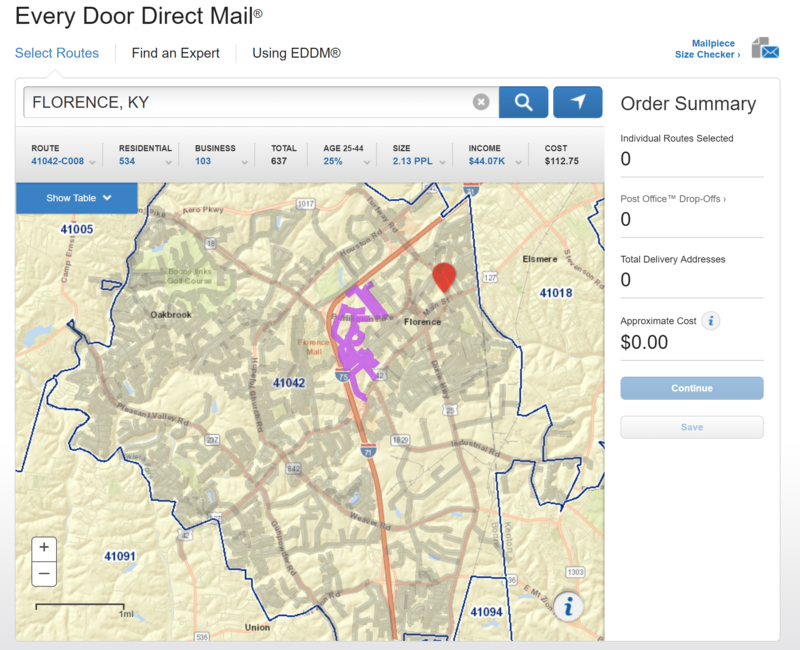 This will pull up a map view containing all mail routes that meet your criteria. All of the streets included will be highlighted in grey. Click once on a street that you would like to target. This will bring up information for that route, along with highlighting in pink all other streets that are part of that route truck route. See the screenshot below. *What you need to know: You will want to make sure that the route you select does not include a condo or apartment complex, or neighborhoods that have lawn maintenance included with their HOA fees. These households will not be in need of your service and you can waste a lot of money mailing to these addresses if you are not careful. You need to know your area to determine this, or drive the routes to double check before selecting them! Step 3: Carefully review the route options paying attention to the information the map tool provides. You will want to note the TOTAL stops on each route and pick routes according to how many postcards you will be mailing. Although you have the option to select to show only residential, please note that by selecting residential only the TOTAL does not change and neither does the cost. If business addresses are on the route, your piece will also be mailed to them. If you are only a residential company you may want to pick routes with very few business addresses. The INCOME tab shows you the average household income and can be helpful if you target certain income levels with your service. The COST tells you how much the postage fee will be if you choose this route. Step 4: When you decide on which route or routes you would like to send your postcards to, double click on these routes. The first click turns the route pink, and the second click on that route turns it blue and adds it to your order. If you want to deselect a route, simply click it a third time and it will go back to its original grey color. See the screenshot below. Once you select routes the Order Summary information on the right-hand side of the map will populate with the details of the routes you have selected. In this example, I have selected 3 individual routes. The Post Office Drop-Offs for this route is 1. This is letting you know that all of the selected routes are handled by a single Post Office location. You will need to drop off your postcards off to the correct Post Office and could very possibly mean you will need to drop them off at multiple Post Office locations. You will be provided with the Post Office location(s) your postcards need to be dropped off at a little later in this process. Total Delivery Addresses is totaling the number of stops from all selected routes. You obviously want to make sure you have enough postcards to mail to your selected routes. Approximate Cost lets you know the total postage fee for your selected routes. When you are happy with your selections, click continue. Step 5: Select Drop-Off Date & Payment Options. Check that you have read, understand and agree to the Terms & Conditions after doing so. Select the date you will be dropping the postcards off at the Post Office by clicking that date box on the calendar provided. Your mail pieces will be on the mail truck to be delivered the very next day. You can then choose to Pay at the Post Office or Pay Online. I highly recommend paying online to avoid waiting in line to pay at the Post Office! You can also save these mail routes and give them a nickname for future reference if you are not quite ready to place your order. You can call 1-800-ASK-USPS (1-800-275-8777) Monday – Friday 8:00 AM – 8:30 PM EST and Saturday 8:00 AM – 6:00 PM EST or stop by your local post office. Step 7: Below is the screenshot of what to do next. All that is left is ‘bundling’ your postcards in stacks of 50-100. I recommend bundling in stacks of 100 unless stacks of 100 are greater than 6″ high, then you would need to break them down into stacks of 50. Purchase some large heavy duty rubber bands to create your bundles. Huge Time-Saving Tip: Instead of counting out all of your postcards, count out your first bundle of cards and then weigh them with a postal scale. Many EDDM postcard printers will offer to bundle your postcards for you for an additional fee. This fee is too much in my opinion. If you use a postal scale this process goes very quickly. Here is an inexpensive postal scale if you do not already have one. Chances are that the routes you select don’t have exactly 300 or 350 stops. Let’s use 378 stops on a route as an example. If bundling in stacks of 100, you would create 3 stacks of 100 postcards and 78 in the final stack. If bundling in stacks of 50, you would create 7 stacks of 50 postcards and 28 in the final stack. 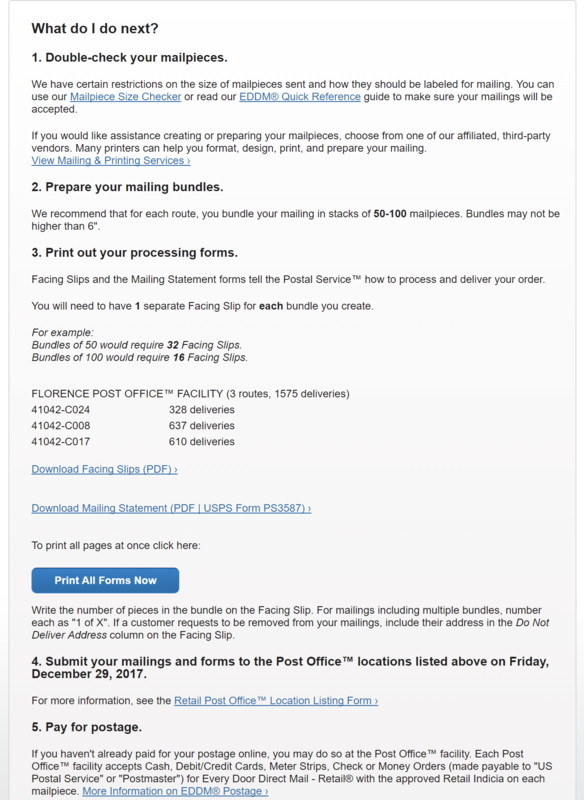 The Post Office provides you with the number of bundles you will need for your order as shown in the screenshot below. Step 8: Now you need to print the corresponding documents and filling them out appropriately. Each route you have selected will have it’s own ‘facing slip.’ You will need to print multiple facing slips for each route. Each bundle will need a facing slip attached to it. The number of bundles you have made for each route is how you will know many facing slips to print for that route. Simply insert the facing slip under the rubber band on top of each bundle. Click “Print All Forms Now” to print your forms. The facing slip(s) will be the last page(s). Since you will need to print additional facing slips to attach to the top of each bundle. Select to print again and this time select the ‘Pages’ option when printing so you can print additional copies of the facing slips according to the number of bundles you have for that route without printing additional copies of the other documents. 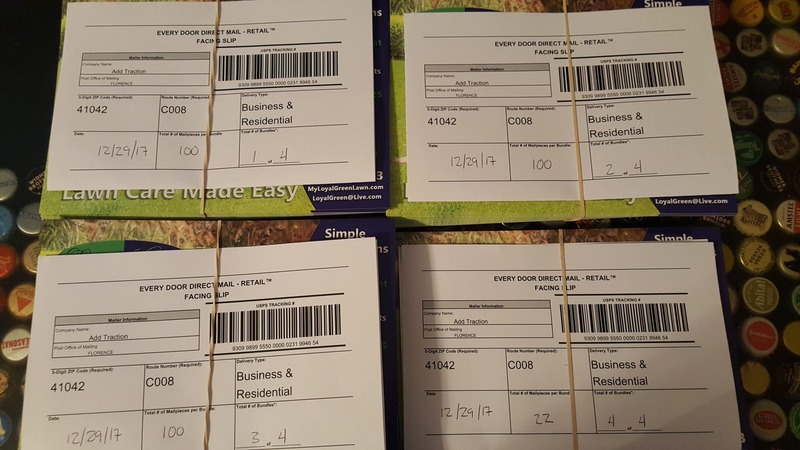 On each facing slip you need to write the date (the date you will be dropping them off to the post office), the number of mail pieces in each bundle, and note bundle number, as in 1 of 5, 2 of 5, and so on. See the example picture below. You can tell the Post Office addresses to not deliver to, but know this request may not be followed simply by human error! Step 9: Congratulations! All that remains now is to deliver your bundles with the corresponding documents to the appropriate Post Office on the date you selected. BONUS: If you are going to spend a couple thousand on EDDM, why not greatly increase your conversion by having yard signs placed nearby where your mailers are going! Signs on the Cheap is the best and lowest priced option around! Click the picture below to get 40% off your order! NEED INFO ON DESIGN AND PRINTING? All of this information does not help much if you do not have postcards to mail! Check out our page on requirements for the EDDM postcards themselves and some design tips to get the best response possible!